Personal retexture of the Psijic robe+hood with some elements from the Ogma Infinium and the Ritual of Illusion. - Uploaded the Keeper of the Ogma retexture for the Konahrik hood as optional file. - Uploaded the Keeper of the Ogma Retexture in HIGH DEFINITION quality. Moved the Low Definition in old version (any case I suggest everyone to download the HD one). High Definition Retexture of the great Psijic robe. Element taken from Ogma Infinium and Arcane Scribblings. Text on the arms are taken from the Ritual book of Illusion. 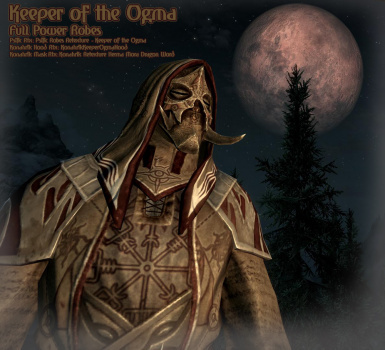 If you use Konahrik with the Psjic robes this is my first mod that brought the first idea for this retexture ( http://skyrim.nexusmods.com/mods/34872). Thanks to PriestMorekai from Deviantart.com ( priestmorokei.deviantart.com/) for 3 elements composition (made with Bethesda graphics) . Exactly the mandala on the back and the central one in the lower part of the robe (different the male one from the female one). Thanks a lot for the inspiration. I saved a lot of time!